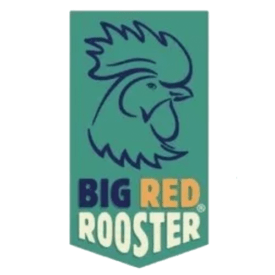 Time for some baby-friendly sleep machines, today I will be reviewing the Portable Baby Sound Machine from Big Red Rooster. This is the baby version of a sound machine I’ve previously reviewed. 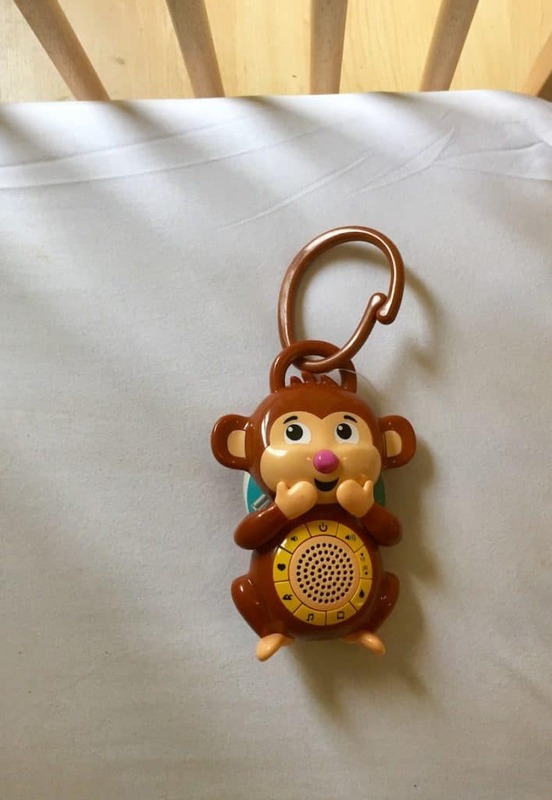 Read on for thoughts on this monkey-shaped, babe-focused sleep aid. 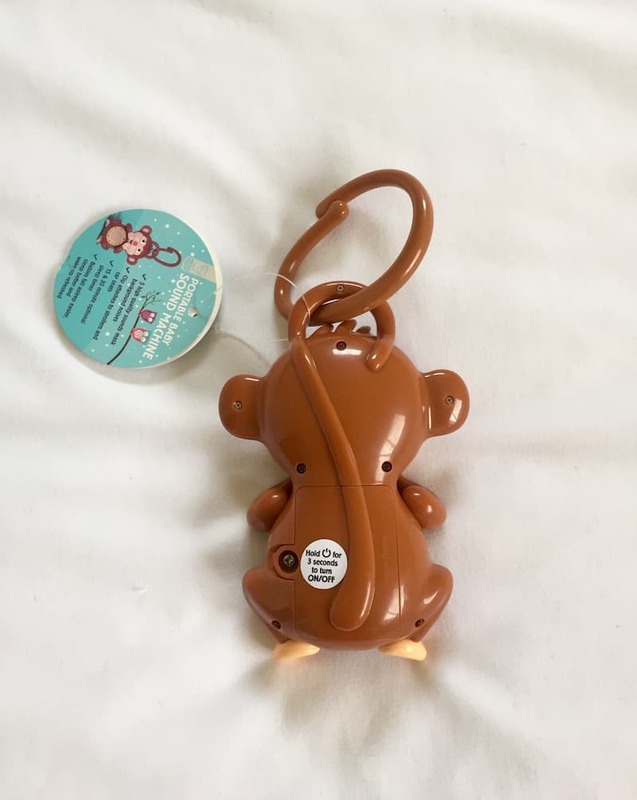 The Big Red Rooster Portable Baby Sound Machine comes with 5 sounds, a clip that can attach to strollers and car seats, and a 15 and 30 minute sleep timer. It is small and can easily be transferred for any walking or riding adventures. Worth mentioning is that this model looks more like a toy than a sound machine. 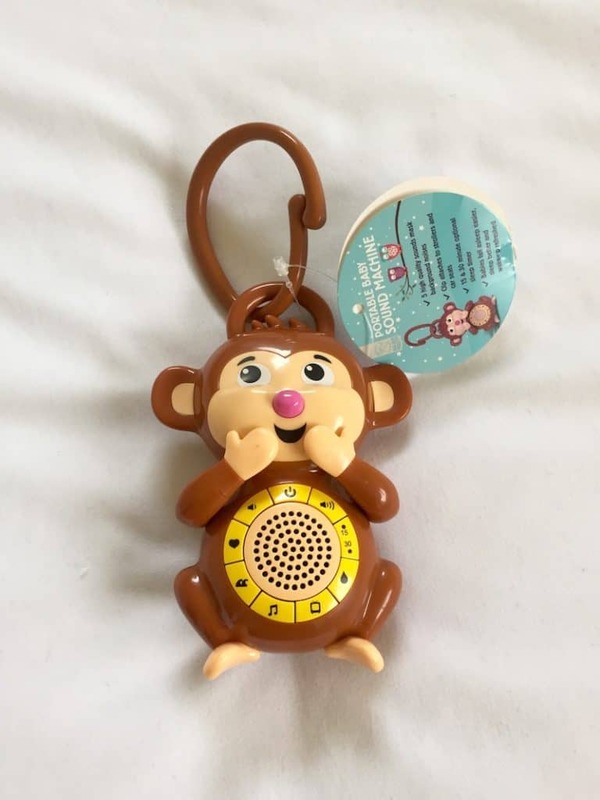 A plastic monkey whose belly is comprised of the speaker and the power and sound options buttons, this may turn into a fun play-thing for your babe or toddler. The Big Red Rooster Portable Baby Sound Machine provides a solid sound alternative to your home sound machine. Easily affixed to a stroller or carseat, this is a good option for parents for travel or even that afternoon stroll (the one where you also try to squeeze in the afternoon nap). If not venturing to a location that boasts its own version of ambient noise, ie: busy restaurants, car wash, a larger gathering, than this an easy and affordable replacement. Heart Beat: strong, mildly annoying and always a little creepy (in my opinion). Ocean: the most subtle and realistic. Rain: this is more like a heavy shower. This machine is only battery operated. To install, unscrew the back panel on the machine and add the 3 AAA batteries (not included with purchase). To turn on and off, hold the power button down for 3 seconds. Select the noise that you prefer and adjust the volume using the buttons to the left and right of the power button. Straightforward in design, but beware that power button. The instructions say to hold it for “3 seconds” to allow the machine to power on and off, however, I was holding it for a good 5-7 before I could get a response. 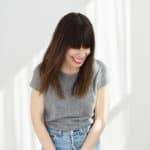 I personally never used portable white noise machines with my children, though now it is something I would definitely entertain giving to an expectant friend. I gave this a whirl on a walk with my oldest son, who is 3, to see if the sound could compare to the city noise. I was impressed with the projection of the sound and thought, if my child younger and if the machine was placed directly near his head in the stroller, this could be a great sleep aid. For travel it is ideal, as the volume can be easily adjusted to drown out any background noise in a foreign environment. The cons are the design. The plastic is clunky and the machine itself does not feel like it could withstand much wear and tear, which is (to me) essential in baby gear. Readily available and very affordable, you can find the Big Red Rooster Portable Baby Sound Machine at Amazon for $12.99 and $19.99 at Bed Bath and Beyond and buybuy Baby. This sound machine was well received and has many online fans who sing its praises. Though there are a few parents who complained about the inconsistency in performance and the quality of the machine materials. I will say that I don’t like the plastic from which it is made. It is very hard and the clip feels very inflexible. I’m afraid I might break it if I try to attach it to anything. I feel like this is a “what you see is what you get, and a little bit more” machine. I did not expect the sound of the Big Red Rooster Portable Baby Sound Machine to project as well as it did, nor did I expect the majority of the sounds to be as clear as they are when played. I would recommend this machine to new parents and to parents who are traveling with a baby or a toddler, as this is something that is small, lightweight and easy to store long or short trips. The one drawback for me is design. 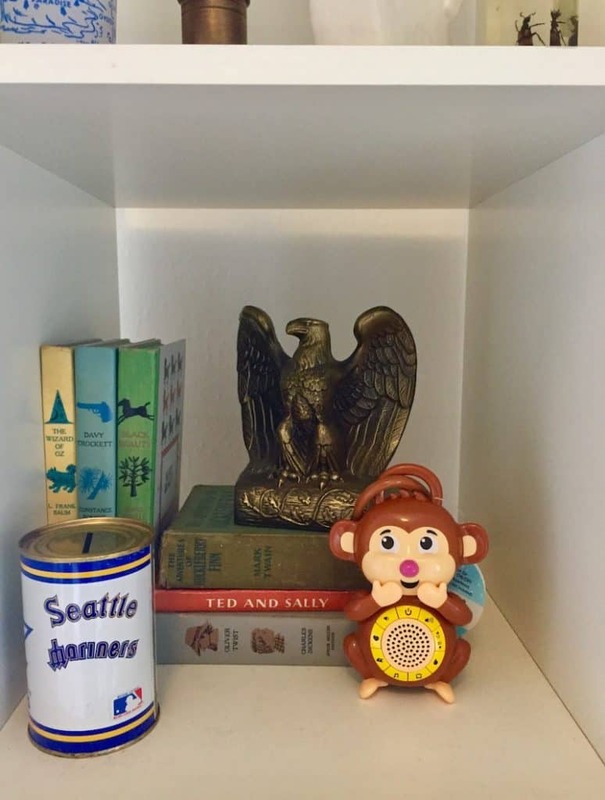 I am not personally a fan of the plastic monkey, but that may be just the thing that works for some parents and provides a cranky child with a much-needed, calming distraction that can lull them to sleep.